After a brief respite from incessant warmongering nonsense following the reelection of Barack Obama in November 2012, it appears old rhetorical devices have reemerged. With a vengeance. Israeli Prime Minster Benjamin Netanyahu, addressing his minions at AIPAC via video chat on March 4, spent a bunch of his time saying supposedly scary things about "Iran's pursuit of nuclear weapons" and dismissing negotiations. Iran enriches more and more uranium. It installs faster and faster centrifuges. It's still not crossed the red line I drew at the United Nations last September. But Iran is getting closer to that line, and it's putting itself in a position to cross that line very quickly once it decides to do so. Netanyahu deliberately ignored the fact that Iran's stockpile of enriched uranium remains far from weapons-grade and that Iran has, for over a year now, been systematically converting much of its 19.75% enriched stock to fuel plates that precludes the possibility of being diverted to military purposes. Of course, the fact that Iran has an inalienable legal right to a fully-functioning nuclear energy program - including the indigenous mastery of the nuclear fuel cycle - was not addressed at all. For Netanyahu and his acolytes, any Iranian nuclear program is synonymous with a weapons program - and not only that, but a weapons program designed to "exterminate" Israel's "Jewish people." Facts remain irrelevant. Hasbara reigns. Netanyahu once again demonstrated his complete disregard for the tenets of the United Nations Charter by calling for Iran to be explicitly threatened with a military attack if it doesn't comply with absurd Israeli demands. He insisted "with the clarity of my brain" (whatever that means) that "words alone will not stop Iran. Sanctions alone will not stop Iran. Sanctions must be coupled with a clear and credible military threat if diplomacy and sanctions fail." Addressing the same audience, Vice President Joe Biden also spoke at length about "Iran’s dangerous nuclear weapons program," which the U.S. intelligence community and its allies, including Israel, have long assessed doesn't exist. The consensus view of all 16 American intelligence agencies has maintained since 2007 that Iran ceased whatever research into nuclear weaponization it may have conducted by 2003, and has never resumed that work. The NIE has been consistently reaffirmed ever since (in 2009, 2010, and again in 2011). In early 2012, James Clapper, Director of National Intelligence, stated in testimony before the Senate Armed Services Committee, “We do not know…if Iran will eventually decide to build nuclear weapons." The same day, Defense Intelligence Agency Director Ronald Burgess said that “the agency assesses Iran is unlikely to initiate or intentionally provoke a conflict” and maintained that Iran’s military doctrine is defensive in nature and designed only for deterrence. Clapper repeated this conclusion verbatim just last week before the Senate Intelligence Committee. Undeterred by facts or reason, Biden continued to tell the AIPAC fanatics that "Iraq's [sic] acquisition of a nuclear weapon not only would present an existential threat to Israel, it would present a threat to our allies and our partners -- and to the United States. And it would trigger an arms race -- a nuclear arms race in the region, and make the world a whole lot less stable." Biden made sure to repeat the mantra that "all options, including military force, are on the table" when it comes to Iran. First, Biden's Iraq/Iran slip wasn't merely Freudian. Since the Iraq script from a decade ago is nearly identical to the Iran script now, it's unsurprising that Biden can't keep his manufactured threats straight. One need only recall Biden's claims on Meet The Press in August 2002 that Saddam Hussein constituted "a long term threat and a short term threat to our national security" and "an extreme danger to the world." Consequently, said Biden, "We have no choice but to eliminate the threat." Years later, on the same program, Biden stood by his statements. When asked by Tim Russert about weapons of mass destruction that didn't exist, Biden blithely insisted that "everyone in the world thought he had them. The weapons inspectors said he had them. He catalogued—they catalogued them. This was not some, some Cheney, you know, pipe dream. This was, in fact, catalogued. They looked at them and catalogued. What he did with them, who knows?" Biden was lying, of course. International weapons inspectors had been perfectly clear about what "he did with them." After losing the Gulf War in 1991, Iraq's weapons programs were subject to intrusive inspections and international sanctions. An IAEA report from 1995 indicated that "all nuclear weapons related activities had effectively ceased" in January 1991, "at the onset of the attack on Iraq by the coalition forces." By 1998, the IAEA concluded that “there is no indication that Iraq possesses nuclear weapons or any meaningful amounts of weapon-useable nuclear material." The next year, the UN Security Council affirmed that UN weapons inspectors "have been effective in uncovering and destroying many elements of Iraq’s proscribed weapons programmes," adding, "The bulk of Iraq's proscribed weapons programmes has been eliminated." In 2000, former UN weapons inspector Scott Ritter explained that "as early as 1997" it was possible "to determine that, from a qualitative standpoint, Iraq had been disarmed. Iraq no longer possessed any meaningful quantities of chemical or biological agent…and the industrial means to produce these agents had either been eliminated or were subject to stringent monitoring. The same was true of Iraq’s nuclear and ballistic missile capabilities." In July 2002, as calls for war grew louder, Ritter wrote in the Boston Globe that "the Bush administration provides only speculation, failing to detail any factually based information to bolster its claims concerning Iraq's continued possession of or ongoing efforts to acquire weapons of mass destruction. To date no one has held the Bush administration accountable for its unwillingness - or inability - to provide such evidence." When, days later, then Senate Foreign Relations Committee chairman Joe Biden convened hearings to assess the threat posed by Iraq and implications of a potential U.S.-led attack, Ritter called the hearings a "sham" and said the Delaware Senator and "most of the Congressional leadership have pre-ordained a conclusion that seeks to remove Saddam Hussein from power regardless of the facts, and are using these hearings to provide political cover for a massive military attack on Iraq." A few months later, in September 2002, Ritter wrote in the Baltimore Sun, "From 1991 to 1998, UN weapons inspectors, among whom I played an integral part, were able to verifiably ascertain a 90 percent to 95 percent level of disarmament inside Iraq. This included all of the production facilities involved with WMD, together with their associated production equipment and the great majority of what was produced by these facilities." That same month, Knight-Ridder's Jonathan Landay reported that "there is no new intelligence that indicates the Iraqis have made significant advances in their nuclear, biological or chemical weapons programs, said a US intelligence official who argues that Cheney's and Rumsfeld's focus on Iraq is hurting the hunt for Osama bin Laden's Al-Qaeda terrorist network." In mid-January 2003, the Associated Press reported, "In almost two months of surprise visits across Iraq, U.N. arms monitors have inspected 13 sites identified by U.S. and British intelligence agencies as major 'facilities of concern,' and reported no signs of revived weapons building...The review of intelligence reports and U.N. records underlines chief inspector Hans Blix's statement that the international experts have uncovered no 'smoking guns' in Iraq in almost 400 inspections since late November." On February 24, 2003, just weeks before the invasion, an article in Newsweek revealed that "Hussein Kamel, the highest-ranking Iraqi official ever to defect from Saddam Hussein's inner circle, told CIA and British intelligence officers and U.N. inspectors in the summer of 1995 that after the gulf war, Iraq destroyed all its chemical and biological weapons stocks and the missiles to deliver them." By the time of Biden's appearance on Meet The Press, the CIA had already published its conclusions that Saddam Hussein had "ended the nuclear program in 1991 following the Gulf war." The Iraq Survey Group had "found no evidence to suggest concerted efforts to restart the program." This information was readily available on the CIA's own website. Similarly, it had already been made clear that the CIA knew there was nothing to find in the first place. Such is Joe Biden's penchant for telling the truth. 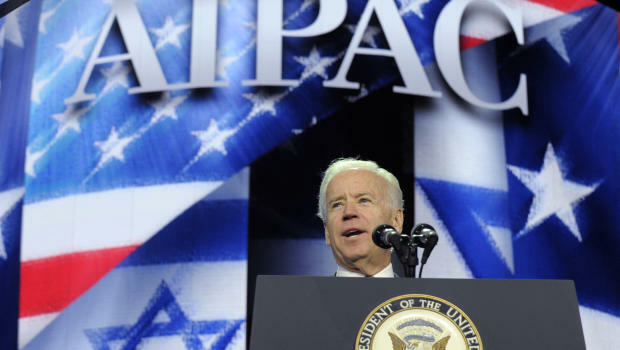 Returning to his comments at AIPAC, Biden's recent fear-mongering hypotheticals about Iran are also wrong. Beyond being obvious that Iran poses literally no threat to the United States, numerous Israeli military and intelligence officials openly reject the notion that a nuclear-armed Iran would "present an existential threat to Israel." Former Mossad chief Ephraim Halevy recently told the UK Zionist Federation that Israel's existence "is not in danger and shouldn't be questioned." Furthermore, Biden's axiomatic contention that an Iranian nuclear bomb would spark a regional arms race has also been rejected for years by less hysterical analysts. In fact, Biden made his comments soon after the publication of a new report by the Center for a New American Security which judged the scenario extremely unlikely. For obvious reasons, Biden claimed that the United States is "not looking for war" and prefers "a diplomatic solution" to the impasse over Iranian nuclear program. Still, he said, the "window is closing" for a negotiated outcome, after which military action would be taken. This formulation has been echoed by senior Obama officials of late, including both Secretary of State John Kerry and Secretary of Defense Chuck Hagel. The window has apparently been closing for some time now and yet, incredibly, Iran never gets any closer to actually having the nuclear weapon it isn't building and that it constantly insists it doesn't want. In early June 2009, Israeli Defense Minister Ehud Barak privately told a visiting Congressional delegation in Tel Aviv that there was an estimated "window between 6 and 18 months from now in which stopping Iran from acquiring nuclear weapons might still be viable." A month later, Joint Chiefs chairman Mike Mullen warned that the "window is closing" on preventing Iran from acquiring a nuclear weapon. He declared that Iran was only one to three years away from successfully building a nuclear weapon and "is very focused on developing this capability." With history repeating itself (remember in early 2001 when the Department of Defense reported, "Iraq would need five or more years and key foreign assistance to rebuild the infrastructure to enrich enough material for a nuclear weapon"? ), it remains crucial to assess facts rather than blindly accept propaganda, to recall the lessons of the past in order to avoid future blunders and to know - unequivocally - that the implications and consequences of the pathological Iraqization of Iran inevitably lead to the commission of murderous war crimes, not merely Freudian slips. 10 years since the last shock and awe has been too long! We need the blood of Iranians now to feed the hungry war gods. It appears as though Americans are asleep or, if they care at all, relinquish their brains to the mainstream media. It is so easy to distract the throng with the bread and circus of "reality" shows and celebrity news. The average American knows more about the who's who of the celeb dating world than where to find Iran on the map. What will it take for the (American part of) human race to embrace peace and a real future for our kids and this lovely little planet? It's as if we are being "governed" by psychopaths hell-bent on destroying us all with wars and economic disasters and who are now paranoid about their own power insisting on domestic spying and drone programs to cover their butts. There are so few politicians who make any sense at all! Biden and Obama are just the next joke in this comedy flop. With so few Americans concerned about anything but their next paycheck, watching their fave TV show and "living the dream", how are we going to make any inroads toward a future that includes a sustainable peace vs. a pax Americana?